My first bike was white and red with three wheels and solid rubber tires. I was perhaps two. When a little older, I remember learning to ride on two wheels, but not before I crashed and fell into a patch of stinging nettles. Before the snow and after the spring melt, my sister and I biked to school and everywhere else. The summer before graduating from high school, a friend and I went on a road trip by bicycle and train. Like all good road trips, we depended on “the kindness of strangers,” injured ourselves (I got my foot jammed under a train door that swung inward on a curve), and slept in a dry ditch one night when utterly lost. In Tokyo, I fell in with a crowd of cyclists and got myself a beautiful purple racing bike with Shimano components. Bicycles are not new to me, yet the Dutch bicycling culture has thrown up a number of surprises. Here’s one spotted today. Ou sont les neiges d’antan, hein? 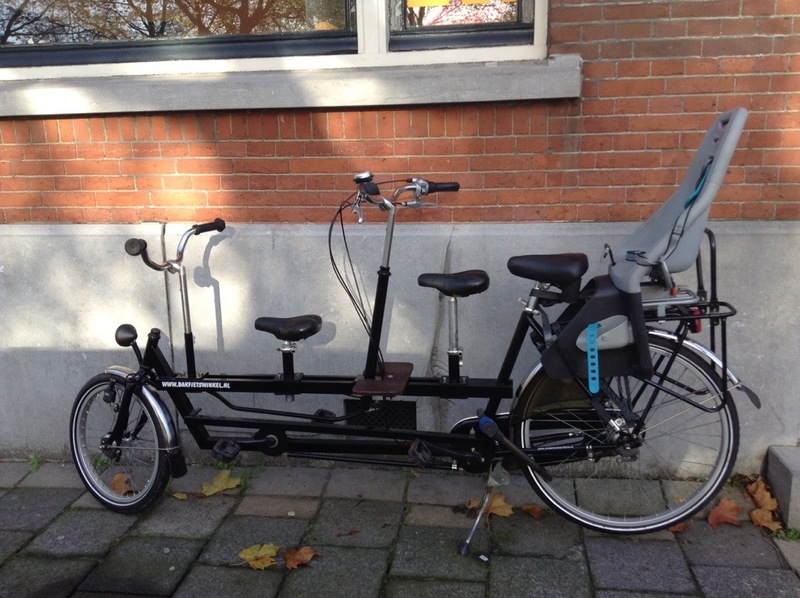 Bikes are so key in The Netherlands. The first years here I didn’t have one, and people thought I was mad, “whaaaaat, don’t you have a bike?”, staring at me as if I came from outer space. I do have one now. Never tried the “family model” though. I just bought one and I’ve noticed people smile at each other when they’re on bikes. Well, at least in Rotterdam they do. Jo, den var fin en gång i tiden.